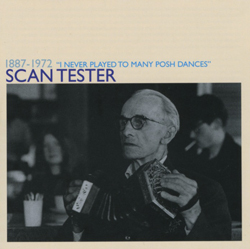 Lewis “Scan” Tester was born in Sussex in 1887 to a musical family. He was something of a prodigy playing from the age of 8 at all sorts of social functions where music was required. While his greatest prowess was on the Anglo-German concertina, he was first rate step-dancer, a fine singer and he also played fiddle, melodeon and tambourine. He was famous in his local area and played almost every weekend at The Stone Quarry Pub for over 40 years. A labour of love, this double CD is a fitting tribute to one of the greatest traditional musicians this country has produced. In the mid 1950s, folklorist and musician, Reg Hall met Scan Tester and invited him to play in his loose-knit band of musicians. Their playing schedule covered the usual pub gigs and private parties and also included a trip to London where Scan played before a full house at the Royal Festival Hall. Game to go anywhere, Scan accepted invitations to clubs and festivals around the country and thus became known and loved by a public beyond his own place and time. Mostly recorded by Reg Hall, these 55 tracks – expanded and remastered from the 1990 vinyl LP – open a window to our musical past.